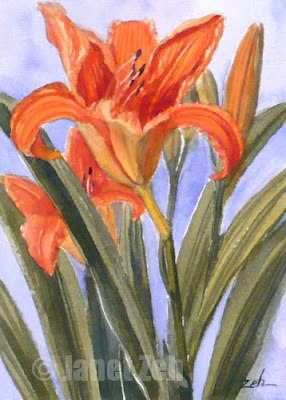 There is something about the "wild" daylilies that bloom along roadsides that I particularly like. They really are not wild as they are not native to North America. All of them were started at some time from plantings and then spread. But how nice to see bright splashes of color in unexpected places. I have them growing on a little hillside by my mailbox. I'd only planted a few several years ago, but it didn't take long before they filled the area. Now they are blooming every day and I love it! I brought one in to use as reference for this painting.